Just got back from an amazing trip with two other artists and friends. We started in Memphis, drove south to Crossroads and Clarksdale Mississippi, Lafayette and New Orleans Louisiana, and took the train up to Chicago. These spots were along the path that Blues/Jazz made it's way up through the country (20's, 30's, 40's). Together, after culling, we have over 2000 photos. Now we paint like crazy people to prepare for Spring shows. Some of this work will be at the OSU Faculty Club Exhibit here in Columbus (March 2012). Other pieces will be part of an exhibit at Roger Lapelle Galery (Philladelphia) with Martin Poole and Tom Gardner. Many thanks to Marty (and Roger Lapelle) for including me in the Philly show. Thought I'd just post one shot to start. "Howl -n- Madd Bill Perry" and gang. We had a chance to hear Alphonso Sanders (on Sax) alone earlier in the night, and then again with Bill Perry at Ground Zero Blues Club (owned by Morgan Freeman) in Clarksdale Mississippi. This show was CRAZY GOOD. 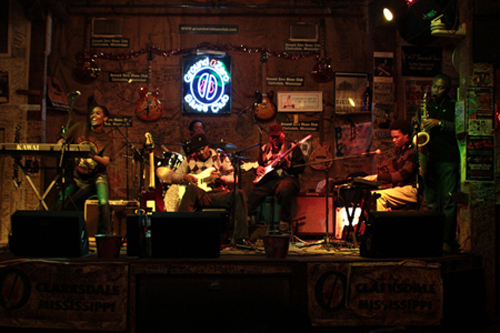 If you like the Blues, you will not be dissapointed in Clarksdale. Unbelievable enegy. Bill's son and daughter are in the band - both talented and thoroughly enjoyable performers. I'll be painting these guys, though I'm not exactly sure how yet.